Often I am privileged to interview authors. 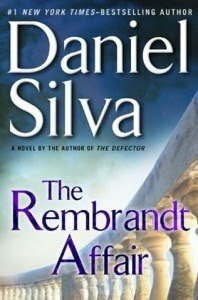 Now I am in a sense the one being interviewed in this non-traditional review of The Rembrandt Affair, the new thriller by NY Times bestselling author Daniel Silva. The publisher presented ten questions pertaining to the book, which I've answered below. If you were to write a blurb in fewer than three sentences for The Rembrandt Affair, what would it be? If you seek excitement, don't leave the house--instead, turn off your computer and cell phone, set out the "Do Not Disturb" sign, and open up the latest thriller by Daniel Silva. Furnished with mystery, art, and intrigue, your requirement for excitement will not only be met but exceeded as you join Gabriel Allon on his new adventures around the world. Professional, unflappable, and perspicacious--that's how I'd describe Gabriel Allon. The Rembrandt Affair takes the reader all over the world. Of all the locations mentioned, which would be your ideal vacation spot? Many of the cities mentioned in the book appeal to me--Amsterdam, Buenos Aires, Paris, Tel Aviv, etc.--but if I had to choose only one, it would be London. I am a bit of an Anglophile, am thoroughly charmed by English accents, and "favour" the ambiance of London. It simply seems so established and civilized and sophisticated. I visited London many years ago, armed with an old Nikon and a sense of awe, and would love to return. Since I don't think my husband would appreciate discovering a beautiful, giant, naked man in the living room, I won't choose David by Michelangelo. I love the work of the Impressionists, and would probably choose a painting from Claude Monet's Water Lilies series, such as Nymphéas, which is absolutely spectacular. The colors and play of light define glorious! My mother is a very strong woman. Along with careers in the medical field and real estate, she raised four daughters without ever complaining. I marvel at the strength and optimism she's shown over the years, which continue now, as she faces health problems with great courage. Who was your favorite “good guy” in The Rembrandt Affair and why? This was my first book by Daniel Silva, and my introduction to Gabriel Allon, who impressed me with his intelligence and compassion. He is a "good guy", a hero without being a stereotypical hero. He never gives up and doesn't compromise his ideals throughout the book, whether he's dealing with art or with people. I know that there's far more technology than I could ever imagine, so it didn't really surprise me. That being said though, what's currently out there is nothing short of amazing. I'm not supposed to quote from my copy of the book, because it's not the final version, so I'll paraphrase a bit. The book says that mobile technology has enabled governments to monitor the words of their citizens, their e-mails, and even their thoughts in ways that were previously just science fiction. The brave new world has definitely arrived! There is only one person I can see in this role. Please don't accuse me of "brown-nosing", but the whole time I read The Rembrandt Affair I pictured the author as protagonist Gabriel Allon. Once I saw the photo below, that's who I imagined as the character. 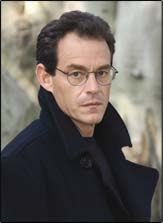 Or maybe there's an actor who resembles Daniel Silva? Thank you for your generosity! I would like to tag my fellow blogger and writer Kim Smith from Writing Space. As the author of a few mysteries herself, I'm sure she'll appreciate and enjoy this riveting book. 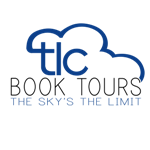 Special thanks to Lisa from TLC and Putnam for including me on this tour. For other such reviews of this book, please visit the other stops on TLC's The Rembrandt Affair blog tour. I'm curious about all the technology in the book now. This tour has been a lot of fun! I loved this interview with you, Suko! The book sounds really interesting, and although it's not in my normal reading genre, I might give it a try! Thanks for the great review! WOW Great 'interview'!! I hope you had fun with this format. I think of the author as being the character, too! LOL Thanks so much for being on the tour. Oh!! How fabulous!! thank you so much, I cannot wait! The publisher presented the questions? Zibilee, this isn't my usual genre either, but it's very well-written and meaningful. I'd love to read more by Daniel Silva. Shelley, welcome! Yes, the publisher came up with a fun questionnaire for all the tour hosts. Thanks for all the comments. More welcomed of course. I like your choice of artwork. Oooh! I'd love to have the David in our house; what a great choice! Still, you're probably wise to go with something tamer. Your new look is AWESOME! Beautifully organized, clean and simple, with all the wonderful componets of your 'old' look. I love your blog look (in case I forgot to mention it earlier). Silva is one author that I have been meaning to read but just haven't yet....sigh! Naida, thank you. Monet's work is gorgeous. Bellezza, thanks for your kind words, which I appreciate all the more because you are so artistic. Diane, thanks! Daniel Silva is an excellent writer. I think you'd enjoy his books.